Two things that I love to eat are pork and noodles. Which means I’m always happy to find a dish that deliciously combines these two great ingredients. Some dishes, like Justin Quek’s gorgeous sounding tagliatelle with summer truffles and sauteed pork neck confit (from his new cookbook, Justin Quek, Passion & Inspiration), take quite a bit of work to make. Others, thankfully, are simpler. One of my favourite pork and noodle dishes is extremely simple. It’s just boiled noodles tossed with a sauteed minced pork sauce. Both the Chinese and the Japanese make variations of this delicious dish. The Chinese call theirs Dan Dan Mian. It’s a traditional street food (supposedly) originally from Chengdu, in Northern China. You can usually find a version of it on the menu of any Northern Chinese dumpling restaurant. 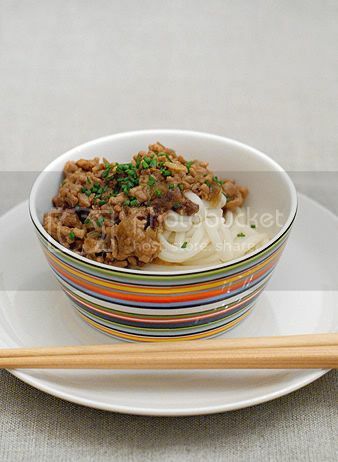 The Japanese enjoy topping either rice or noodles with stir-fried minced pork and spring onions. They call this quick and easy stir-fry Negi to buta-niku no itame (which is a bit of a mouthful for the rest of us). Making either the Chinese or Japanese versions of this quick and simple supper is relatively easy. I suggest following the recipes faithfully once or twice first and then deviating at will and to taste. You can decide what style you want and how you want your pork flavoured. I change the way I cook this almost every time I make it, often based on what’s in my pantry and fridge at the time. You can also choose the kind of noodles you want to eat. I enjoy having mine with somen noodles. I like the weight, bite and taste of this wheat-flour noodle. The great thing with this dish is that you can always cook up a little more minced pork than you need. Pop the extra portions in your fridge or freezer. And the next time you’re feeling a little peckish, a great, comforting meal is only minutes away. All you have to do is boil your noodles, defrost the pork and you’re ready to chow down. Kimiko Barber’s The Japanese Kitchen has a great, simple Negi to buta-niku no itame recipe. I’ve copied it below for you all the try out. If you want a really good, authentic Dan Dan Mian recipe, you should check out Fuschia Dunlop’s Sichuan Cookery (called Land of Plenty in the USA). If you want to find a really simple version, however, you can pick up Les Huynh’s new book Takeaway. Heat the oil in a wok or large frying pan over high heat. Add the pork and chopped mushrooms. Stir-fry for 5 minutes before adding the spring onions. Add the sake and soy sauce to the work. Stir well, then serve over noodles or rice. Did you use light or dark soy sauce? You are so right. This is a real yummy simple sauce. I use it often especially with the ‘rat tail noodles’ and even with fusilis for a east west twist. At times, garnish it on top of a block of soft tofu is real comfort food for the family. Every now and then I put in a sprinkling of preserved szechuan vegetable to add a bit of zing!! Yummy! Dan Dan Mien was a very economical meal to have when living in Melbourne. We would be visiting Chinatown and eat he huge bowls of Dan Dan Mien. It was so simple, so cheap and so so delicious! I can’t wait to try this. It sounds so simple, so full of flavor, and the perfect simple thing to enjoy when I can’t think of what I want or feel like spending hours in the kitchen. i’m a HUGE fan of dan dan mien. do you also like the somewhat related korean dish, ja jiang mien (the sauce has a totally different consistency though)? that’s another favorite of mine. thanks for the post… brings back some good flavor memories. I love dan dan mien. I’ll have to try this recipe soon! one thing i’ve noticed is that there doesn’t seem to be a “standard” version of dan dan mian outside of china (including even hk). even though every restaurant / eatery calls their version “szechuan dan dan mian”, the sauce for the dish invariably differs. eg: cj’s version is soup-based, the soup is rather thick due to the addition of a large dollop of peanut paste, and laden with chili oil (though strangely enough, it doesn’t taste too chili-hot), and there’s nary a hint of szechuan peppercorn. din tai feng’s is almost like a “gan lao mian”; the sauce is almost all peant paste. neither chili oil nor szechuan peppercorn is added. man jiang hong’s (in hk) is like cj’s, but less chili oil and more peppercorn. … just to give a few examples. i always wonder why the huge discrepencies amongst restaurants outside of china when it comes to szechuan dan dan mian, particularly since the dish *is* rather standard in szechuan eateries in mainland china – sauce is heavy with chili oil and szechuan peppercorn (though the use of peppercorn is far tamer than in other szechuan dishes such as “fu qi fei pian”). no peanut sauce. anyone can provide an explanation? p.s. ch, i don’t think chengdu can be considered northern china, since it is part of szechuan, which is more or less in the southwest region of china. I just tried this recipe but substituted somen for udon and shitake for brown buttons. I like the quality dried udon from good supermarkets. Overall the taste was on the bland side. I added some salt to taste. To finish I added some cilantro. A dash of chilli flakes also adds liveliness to the dish. Anonymous: I like using dark soy, but that’s only a personal preference. Nyetzy: The addition of the preserved szechuan vegetable is perfect. It really does add a great flavour. Keropak man: It’s still cheap here in Singapore. My favourite place for it only charges S$5 an order. Matt: I’m sure you’ll be able to come up with your own very cool twist to this. Jack: Haven’t tried the Korean version yet. I’ll have to try that sometime soon. Belinda: Remember, it’s only a guideline. The fun of cooking is creating your own version. Anonymous: As I suggested, you should definitely take the basic recipes and tweak them according to your own taste. I’m glad you were able to create your very own and yummy-tasting version. This reminds me of something my mom used to make 🙂 I love Japanese food! I wonder if dan dan mian is the same thing as the Japanese tan-ta-me that’s ubiquitous in those small ‘Chinese’ eateries (not ramen shops) all over the country? The tantame I’ve eaten are your simple pork noodles but very spicy (the dish just looks red). Delicious! Actually, I added garlic, ginger, a touch of Chinese spicy miso, some Chinese chicken soup stock and a slurry of corn starch but the base of the buta to negi dish was great! All other dan dan mien recipes just seemed very involved so to start off with something so simple and then add whatever I wanted to it was just wonderful! Thank you for posting the recipe. I tried this recipe tonight and it was really easy and nummy! I will definitely be making this again and again and again. Yummy. Thanks!